Thousands of people are expected to attend the People’s Climate Movement march in Washington, D.C. and sister cities around the world this coming weekend. They are marching because actions taken to date by governments and others are not commensurate with the scale of climate impacts – both those already borne and those projected in the years to come. It’s a good moment to reflect on the facts. What do we know about global climate change, and what impacts can we expect in the future? The following graphics speak volumes. Coming to Washington for the People's Climate March? Join us for a WRI Teach-In on Friday, April 28. Climate change is a long-term change in Earth’s weather patterns or average climate, including temperature and precipitation. 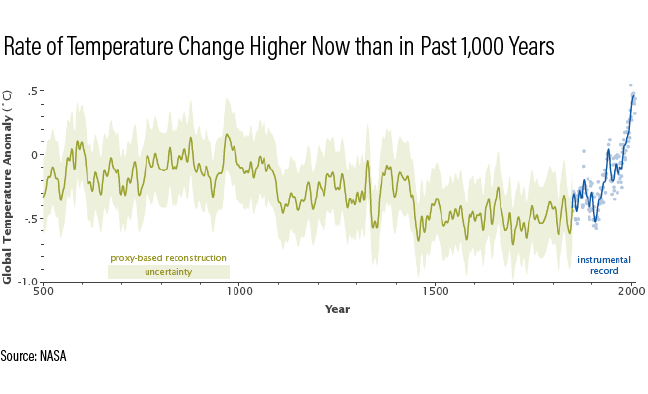 While the climate has changed in the past, we are now seeing it change at an unprecedented rate. As a result of the build-up of heat-trapping greenhouse gases in the atmosphere – due to our burning of fossil fuels, cutting down trees and other activities – global average temperature is now changing at a faster rate than at least over the past 1,000 years. 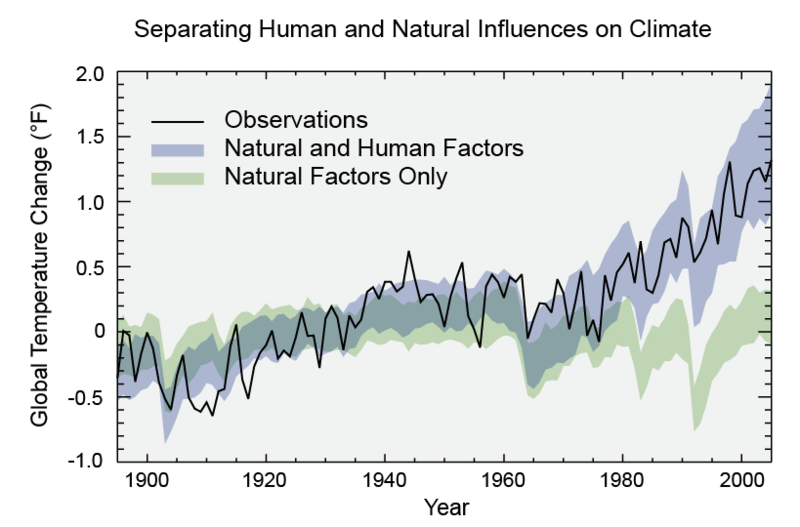 When models only include natural drivers of climate change, such as natural variability and volcanic eruptions, they cannot reproduce the recent increase in temperature. Only when models include the increase in greenhouse gas emissions due to human activities can they replicate the observed changes. 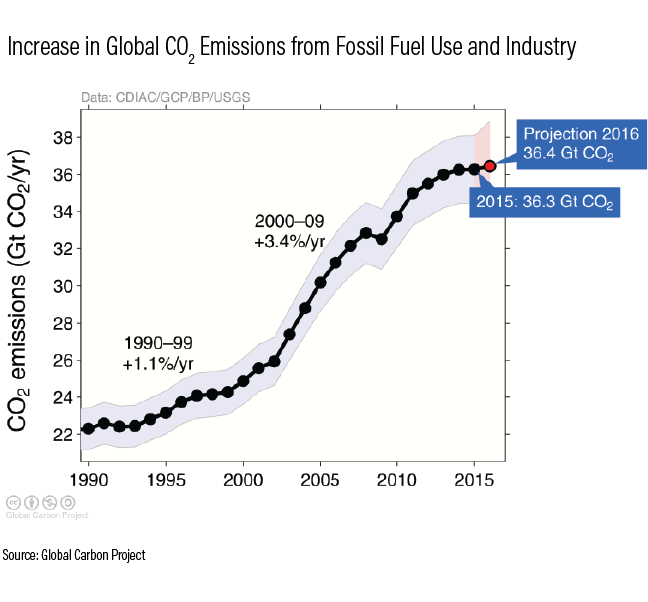 How have global emissions changed? Emissions have been climbing since the Industrial Revolution, but the rate of annual emissions increase during the first 10 years of this century was almost double the rate between 1970 and 2000. Emissions from fossil fuels and industry have seen a staggering increase in recent years – 63 percent since 1990.
Who are the biggest emitters? From 1850 to 2011, the five major emitters—the United States, European Union, China, Russian Federation and Japan— together contributed two-thirds of the world’s CO2 emissions. Now, China has emerged as the top emitter, and China, the EU and the United States are the world’s top three emitters. Together they emit more than half of total global greenhouse gases. 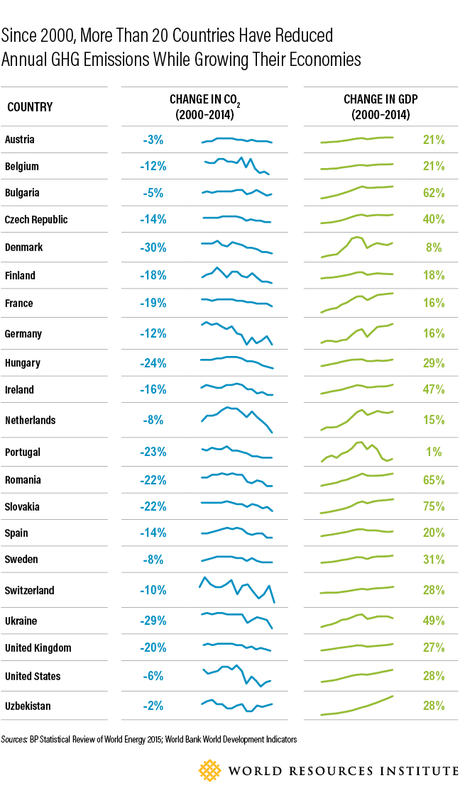 In contrast, the 100 smallest-emitting countries collectively add up to only 3.5 percent of global emissions. Almost three-quarters of global emissions come from only 10 countries. How much should we limit global warming? The Paris Agreement on climate change sets a target for countries to collectively limit global temperature rise to 2 degrees C (3.6 degrees F), with a goal of sticking to 1.5 degrees C (2.7 degrees F) in order to prevent some of the worst effects of climate change. The amount of carbon emissions we can emit while still having a likely chance of limiting warming to 2 degrees is known as the “carbon budget.” As of 2011, the world had already blown through nearly two-thirds of the carbon budget and is on track to exceed it by 2033 if emissions continue unabated. Where is the temperature headed? 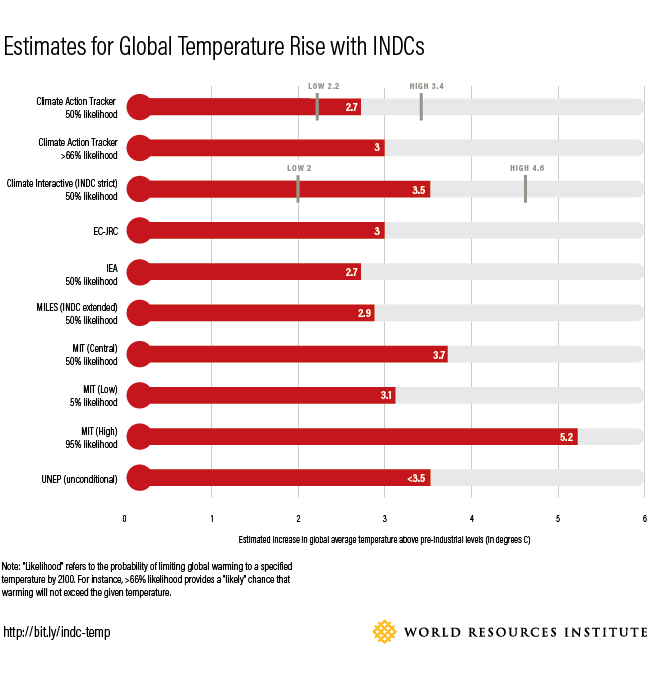 In the absence of countries’ recent emissions-reduction commitments, known as intended nationally determined contributions, or INDCs, we would see 4-5 degrees C of warming. 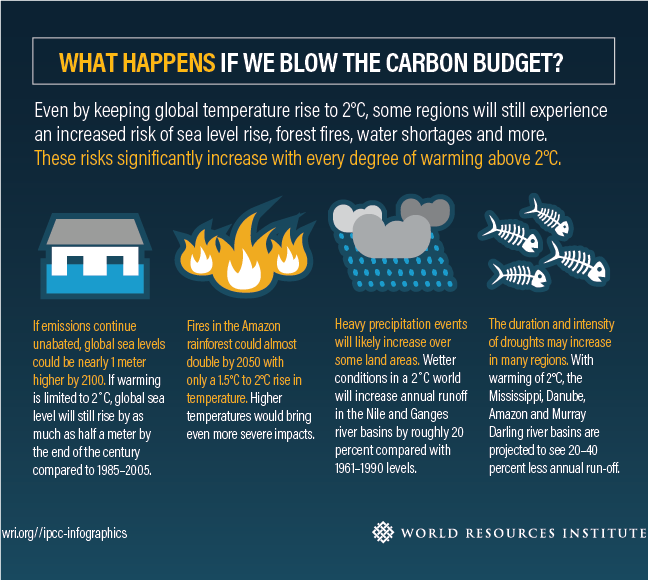 Even if these INDCs are fully implemented, the average global temperature is still on track to increase 2.7-3.7 degrees C by 2100, according to a range of studies. That’s far short of the global goal to limit warming to 1.5- 2 degrees C.
What have been some of the impacts of climate change to date? The impacts of climate change are already occurring, and occurring everywhere. For example, climate change has already led to: more negative than positive impacts to crops, such as wheat and maize; coral bleaching and species range shifts; more frequent heat waves; coastal flooding; increased tree die-off in various regions; and a significant loss of ice mass in places like Greenland and Antarctica. 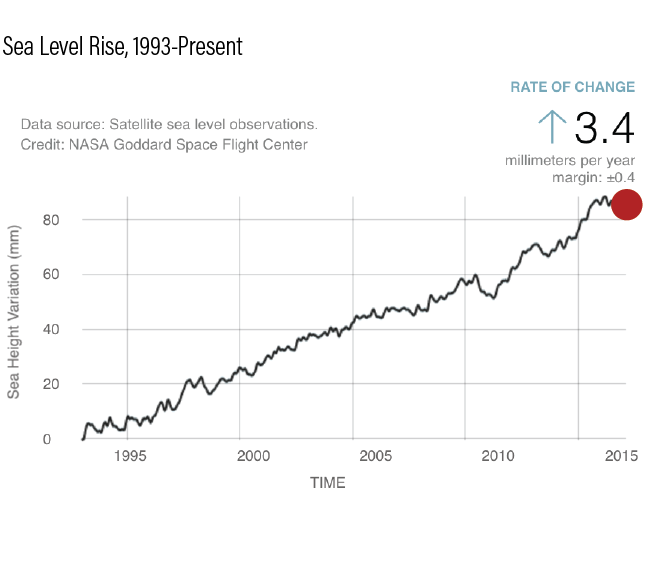 For example, as a result of ice melting on land, such as from glaciers and ice sheets, as well as thermal expansion of the ocean, we have seen sea level rise 3.4 millimeters per year from 1993-2015, which puts coastal communities at risk of flooding and infrastructure damage. What impacts do we expect in the future? The impacts we see in the future will be determined by our emissions pathway and resultant level of temperature increase. 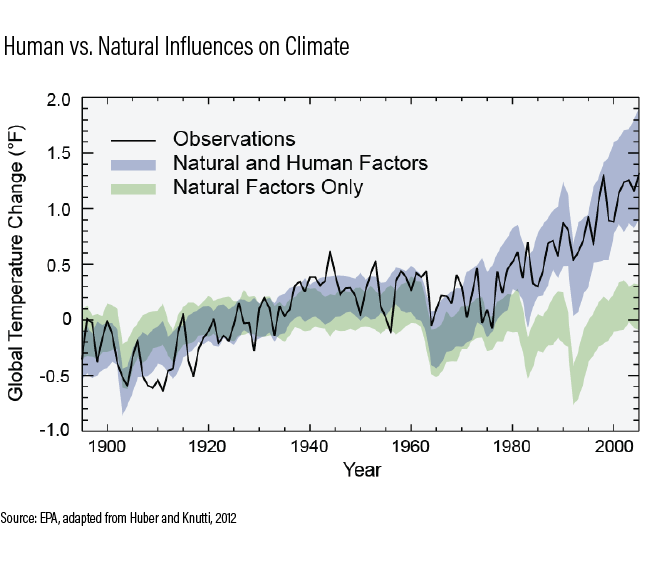 The warmer it gets, the greater the impacts – and the lower our ability to adapt. Are there signs of progress? Recently, we’ve seen signs of “decoupling.” According to the IEA, energy-related carbon dioxide emissions stayed flat for three years in a row even as the global economy grew. This flattening of emissions was due to the growth of renewable power generation, fuel switching from coal to natural gas and energy efficiency gains, among other changes. This decoupling can also be seen at the country level in 21 nations from 2000-2014. Whether these are indicative of long-term shifts remains to be seen. We will need to see a deep decline if we are to limit dangerous climate change, and even with existing emissions-reduction commitments, global emissions are not expected to decline until at least after 2030. Are we investing in solutions? 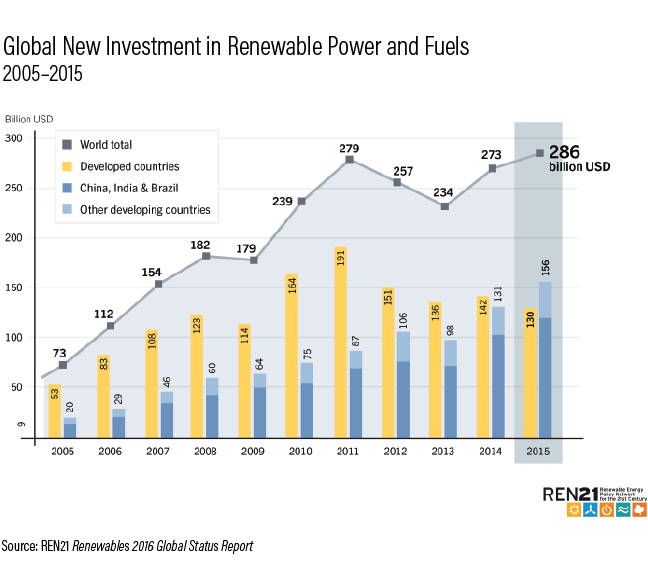 Global investments in renewable energy have been growing in recent years to an all-time high of $285.9 billion in 2015, a 5 percent rise compared to the previous year. In 2015, renewable energy (excluding large hydro) made up the bulk (54.6 percent) of new installed generating capacity for the first time. That being said, we need to shift away from fossil fuels much more quickly if we are to have a fighting chance of limiting warming to 1.5-2 degrees C.
Let’s hope that as people take to the streets, it will wake leaders up to the scale of the climate change challenge and the task ahead. Avoiding the most dangerous of climate change impacts -- which necessitates phasing out emissions in the second half of the century -- will require sustained action well beyond this weekend’s activities.